THE AUSTIN 7 – THEN AND NOW. The Austin 7 was produced from 1922 to 1939 and was the first truly affordable mass-produced vehicle of British design and manufacture. The importance of the heritage of the Austin 7 cannot be overstated as without it the Austin company would have financially failed, the pre-war population would have been deprived of the chance of owning their first motor car and the 750 Motor Club would probably not have come into existence. In fact several well-known companies might not have succeeded if they had not been able to become licenced manufacturers of the design. The first BMW was a 7, known as a Dixi in Germany, and in Japan, Nissan based their first cars on it. The Swallow version of the Austin 7 laid the foundations of the Jaguar Car Company. Some 290,000 Austin 7 cars were produced by Sir Herbert Austin’s company and about 11,000 are thought to still exist worldwide. They came in a variety of models that included saloons, tourers, sports cars and vans. When launched the Austin 7 cost just £165. Its original 696cc engine of 7.2 horsepower was quickly enlarged to 747cc. The revised four cylinder side-valve engine gave a very modest 10.5 brake horse power but it was enough to propel the little car to a top speed of 50 miles per hour. Many a 1930s family packed children, luggage, mum and dad into the tiny cabin and set off on holiday to far flung parts of the country – and abroad. Since its birth the Austin 7 has been driven up mountains, across seas, through rivers, around racing circuits, into war zones and into history books. It is still being used for adventures all over the world. Today the Austin 7 is as popular as ever and it provides one of the most inexpensive of routes into pre-war and vintage car ownership. Useable examples of later models such as the Ruby can be found for under £3000 whilst top quality restorations of early models like the Chummy will run to £15,000 and more. Rare models or those with a competition pedigree command still higher figures. The running costs of a road going Austin 7 remain very much at the budget end of the classic car spectrum. There is no road tax to pay, no MOT test required (though an unofficial annual check is a wise precaution) and insurance is very inexpensive – often less than £100 per annum including European cover and breakdown service. A network of cherished suppliers provides owners with a comprehensive range of spare parts for their vehicles and almost all replacement items are readily available. It is even possible to purchase newly manufactured parts for the Austin 7 and there are many companies and individuals who will undertake work on the cars if the owner doesn’t want to tackle the job themselves. However, the Austin 7 is one of the most straightforward of cars to work on and there are very few jobs that a reasonably competent enthusiast could not undertake. Unlike modern cars every bit of an Austin 7 can be fixed, fettled, maintained or modified. It makes running one a joy – and you’d be hard put to find a friendlier and more welcoming bunch than a group of A7 owners. You can use a Seven for gentle meandering through country lanes, thrashing round a racing circuit, sliding along a trials course, or racing up a hill climb. Whatever you choose there’s an A7 for you and it will rise to meet any challenge. 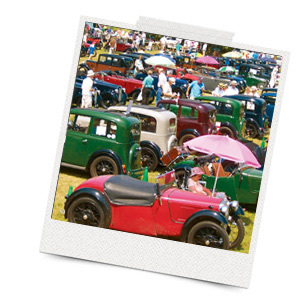 One of the best places to see many Austin 7s together is the National Austin 7 Rally, organised for all A7 owners and clubs by the 750 Motor Club, and held each year in the grounds of the National Motor Museum at Beaulieu in Hampshire. The first such rally took place in 1963 and no other single marque club has ever kept to the same venue for such a long and continuous period. For those contemplating ownership of an Austin 7 the first point of contact should be the local centre of the 750 Motor Club (details on this website). There you will find friendly and helpful advice and perhaps even a car to buy. The Austin 7 was once known as ‘The Motor for the Millions’ and as it motors steadily towards its centenary in a few year’s time it is still giving great pleasure to all who drive it or see it on the road.